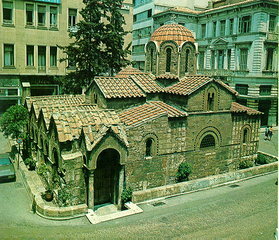 The church of Panaghia is built on the ruins of an ancient temple, dedicated to a female goddess, possibly Athena or Demeter. It was founded at the beginning of the 11th century (around 1050 A.D.) and was probably named after its donor. The church is cross-in-square, of the complex four-column type, with three apses on the east side and a narthex on the west. A domed chapel dedicated to Aghia Varvara was added to the north side and the exonarthex, with three pitched roofs, was built slightly later in front of both churches. It was originally formed as an open portico but a small porch with two columns was constructed at its south end, possibly in the 12th century, along with the mosaics over the entrance. The walls of the church are built in the typical cloisonne masonry and are decorated with very limited brick, Cufic ornaments. Most of the paintings inside the church are the work of the famous modern Greek artist Photis Contoglou, signed in 1955.